As part of the Pictures and Sounds concert series, WHPK and Global Voices are hosting a show at the International House this Tuesday. Berlin-based Rashad Becker, New Yorker Eli Keszler, and Chicago-based Josh Abrams’s Natural Information Society will perform tomorrow, accompanied by an “interactive video work from St. Louis artists Kevin Harris and Jeremy Kannapell.” The artists’ past shows include presentations of Keszler’s visual work at the Victoria & Albert Museum, South London Gallery, Tectonics Festival (Harpa Hall) Reykjavik, Centraal Museum in Utrecht and Boston Center for the Arts among several others. Abrams has also collaborated with Hamid Drake, Tortoise, Tony Conrad, Craig Taborn, and Bill Dixon, to name a few. A dynamic musical and visual art concert–going experience on a Tuesday night: definitely something worth checking out. International House, 1414 East 59th St., Tuesday, November 6, 8 p.m, free admission. This Friday, renowned graphic novelist and television writer Ariel Schrag will host a lunch at the Centers for Gender/Race Studies to discuss her life and work. Schrag rose to fame at a young age after writing and illustrating comics about her high school life while still in high school. These comics were published in four volumes shortly after her graduation, earning Schrag a nomination for the Kimberly Yale Award for new women comic book writers. Her graphic novels deal with issues such as her own sexuality, family, experimentation with drugs, and other relevant topics. In her adult life, Schrag has written for television shows such as The L Word on Showtime and How to Make It in America on HBO. November 7, Centers for Gender/Race Studies, Room 105, 12 p.m., free admission. In the summer of 1968, the city of Chicago was sent into turmoil as the 1968 Democratic Convention took place in Lincoln Park. Protesters, angry with the government’s handling of the Vietnam War, Lyndon Johnson’s domestic policies, and the assassinations of Robert Kennedy and Martin Luther King, Jr., clashed with police officers and eight people were afterwards charged with attempting to incite a riot. The Chicago Eight (also known as the Chicago Seven) are the focus of two films that the Logan Center will be showing on Sunday. The first film, The Great Chicago Conspiracy Circus, takes the proceedings of the Chicago Eight trial and mixes them with the story of Alice in Wonderland, highlighting the insanity of the real-life trial. Meanwhile in The Conspiracy and the Dybbuk, a group of Jewish radicals perform an exorcism on the presiding judge in the trial to rid him of an evil spirit. Both incorporate actual dialogue from the trial intermixed with elements of fantasy, and it should be a surreal and thought-provoking evening of film. November 9, Logan Arts Center, Room 201, 6 p.m., free admission. This past Sunday, seventh-generation tightrope walker Nik Wallenda completed his much anticipated Chicago Skywalk: a death-defying journey between the Marina Tower and Leo Burnett building, 700 feet above the Chicago River. For his efforts, Wallenda was showered with praise; Mayor Emanuel even declared Monday to be Nik Wallenda Day in Chicago. When did tightropes get so popular, anyway? The answer: a while ago. According to acrobat and noted hippy diva Hermine Demoriane in her book on the subject, the ancient Greeks had already gotten the art of the tightrope down to a multifaceted science, until “they simplified it down to one word: ‘funambulism.’” The term is now primarily used in France (that Mecca of acrobatic buffoonery), and is derived from “tunis” meaning rope, and “amble” referring to a leisurely morning stroll to the bakery for espresso and a croissant. Three thousand years later, the Wikipedia article on the subject lists no less than 13 modern and pre-modern sub disciplines of fundambularism, including high wire (performed at height), slack lining (performed with a slack line) and freestyle “rodeo” slack lining (unclear). For an activity that involves mostly walking back and forth on a rope, the tightrope is a nuanced art indeed. The art reached its zenith over the boiling waters of Niagara Falls in the mid-1800s. 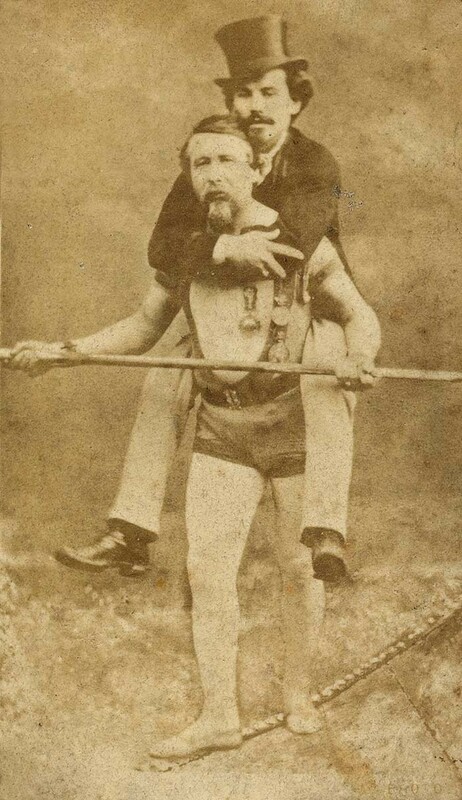 There, two of the early greats—Charles Blondin and William Leonoard Hunt (aka the Great Farini)—took the tightrope out from under the big top and into the open air. The two rivals competed for audiences’ affection with ever more daring feats—among them, making an omelet and doing a load of laundry, all while balancing hundreds of feet in the air. From there tightrope walkers went ever higher, sometimes with mixed results. High-wire pioneer and Flying Wallenda patriarch Karl Wallenda (Nik’s great-grandfather) fell to his death in 1978; his sister-in-law Rietta met a similar fate in 1963 (or, as Roger Sterling put it, “They got her off the sidewalk with a hose.”). It can’t be easy to walk the high wire with that kind of weight on one’s shoulders, but Nik certainly made it look that way. He did it blindfolded, too.